UN Secretary General Ban KI - moon was presented with a letter signed by Mr Abbas as “President of the State of Palestine, Chairman of the Executive Committee of the Palestine Liberation Organization“. “This application for membership is being submitted on the Palestinian people’s natural, legal and historic rights and based on United Nations General Assembly resolution 181 (II) of 29 November 1947 as well as the Declaration of Independence of the State of Palestine of 15 November 1988 and the acknowledgement by the General Assembly of this declaration in resolution 43/177 of 15 December 1988. 1. Mr Abbas falsely continues to use the title “President of Palestine” although his term of office expired on 1 January 2010 pursuant to Article 36 of the Basic Law 2003 (as amended). 2. The application does not identify the territorial boundaries of Palestine and thus would preclude any action by the UN against such a member - should the provisions of the UN Charter be breached by it in the future. 3. No State can be admitted as a member of the UN that fails to comply with the preconditions necessary for the declaration of Statehood pursuant to the Montevideo Convention 1933. The Declaration of Independence of the State of Palestine on 15 November 1988 is similarly deficient. 4. Basing the application on UN General Assembly Resolution 181(11) of 29 November 1947 is meaningless since this Resolution was rejected in 1947 and has become extant. General Assembly resolutions in any event are not binding in international law. 5. As Chairman of the Palestine Liberation Organization (PLO) - Mr Abbas is committed to maintaining the territorial indivisibility of Israel, Gaza, the West Bank and Jordan under Article 2 of the PLO Charter. 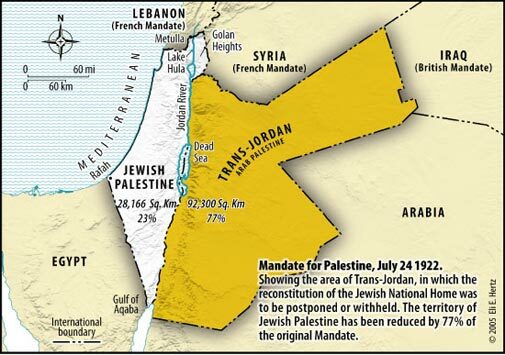 The current application contains no mention of his intention to revoke this provision in the Charter or to forgo any claims to any other parts of this territory from either Israel or Jordan. An unconstitutional President claiming to be the sole spokesman for the Palestinian Arabs when he clearly is not - as his unresolved power struggle with Hamas shows - applying for membership of the United Nations for a country within undefined boundaries that is not controlled by the PLO whilst claiming to respect and observe international law when the opposite is demonstrably evident - is indeed the theater of the absurd into which the UN finds itself being propelled once again..
“After all, it was here in 1975 that the age-old yearning of my people to restore our national life in our ancient biblical homeland—it was then that this was braided—branded, rather — shamefully, as racism. And it was here in 1980, right here, that the historic peace agreement between Israel and Egypt wasn’t praised; it was denounced! And it’s here year after year that Israel is unjustly singled out for condemnation. It’s singled out for condemnation more often than all the nations of the world combined. Twenty-one out of the 27 General Assembly resolutions condemn Israel—the one true democracy in the Middle East. Well, this is an unfortunate part of the UN institution. It’s the—the theater of the absurd. It doesn’t only cast Israel as the villain; it often casts real villains in leading roles: Gadhafi’s Libya chaired the UN Commission on Human Rights; Saddam’s Iraq headed the UN Committee on Disarmament. You might say: That’s the past. Well, here’s what’s happening now—right now, today. Hezbollah-controlled Lebanon now presides over the UN Security Council. This means, in effect, that a terror organization presides over the body entrusted with guaranteeing the world’s security. The theater of the absurd is definitely set to swing into action once again at the UN over the next few weeks. As it does so - the authority and standing of the UN is set to sink into further disrepute. Palestine - Will The UN Endorse Ethnic Cleansing? Palestine - Is Obama Honouring The Bush Pledge?